As the first serve of the French Open draws closer spread betters are rubbing their hands together at the mouth-watering prospect of two weeks tennis from the French capital. It’s hard to ignore ‘The King of Clay’ Rafael Nadal’s recent slide to world No.7. With the tournament prioritising ATP rankings over previously French Open success, Nadal’s seeding means he will now face favourite Novak Djokovic in the quarter-finals if both men were to progress that far. The Spaniard has won the French Open every year since 2005, having defeated Djokovic in four sets at last year’s final. However, Nadal’s previously formidable form on clay has come crashing to a halt this year with a loss to Andy Murray at the Madrid Masters the latest in a line of disappointments. Djokovic’s year has been quite the opposite. The Serbian is unbeaten on clay, having claimed his fourth Italian Open title with a win over a rejuvenated Roger Federer last Sunday. Although he has never beaten Nadal at Roland-Garros, this campaign looks like his best opportunity to finally get his named etched onto the Coupe des Mousquetaires. Djokovic starts as clear favourite on our Win 60 Index with a spread of 37-40. Roger Federer, however, should not be overlooked after a fine run of form. The 33 year-old successfully defended his Dubai Tennis Championships title with a straight sets victory over Djokovic in the final, and is second favourite to triumph in Paris at 20-23. Having seemingly overcome performance hindering back problems, Andy Murray is also undefeated on clay this year having won his first tournaments on the surface in Munich and Madrid. Although he did withdraw from Rome citing fatigue. 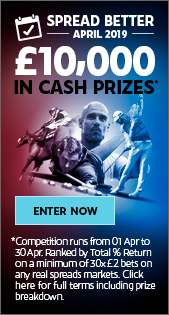 Sporting Index offers the most exciting betting experience around for tennis bettors Sporting index is the market leader when it comes to golf spread betting, offering the widest variety of markets and the most exciting betting experience. 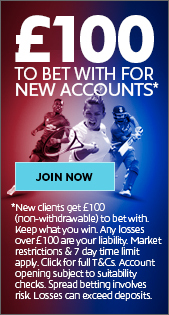 With the widest selection of specials markets, and unique bets you can’t find anywhere else, no-one offers bettors such an exhilarating way to enjoy betting on tennis.